From March 7th till April 7th, 2018 all those, who will join Ucom’s mobile internet for 18 months via regional U!Go 3500 or standard U!Go 5500 tariff plan, will permanently receive twice more gigabytes of high-speed internet. The offer is applicable not only to the new subscribers, but existing ones without current commitment. Thus instead of 15 GB included in the U!Go 3500 tariff plan the subscribers will receive 30 GB, while the subscribers of U!Go 5500 tariff plan will receive 80 GB instead of the previous volume of 40 GB. «All those wishing to test the fastest mobile network as per SpeedTest assessment should hurry up to join this offer, as the volume of doubled gigabytes up to 80 will be provided forever», said Hayk Yesayan, Director General at Ucom. 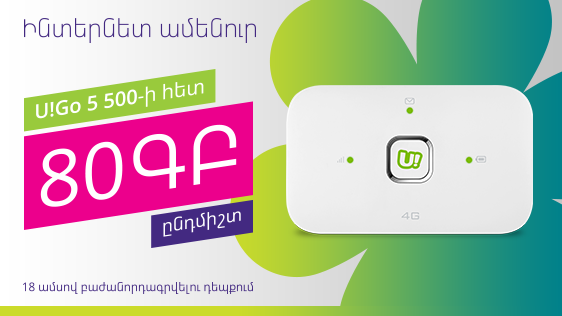 Within the frames of the offer it is possible to acquire a U!Fi mobile internet modem compatible with 4G+ network. This mobile modem, which has the possibility of connecting up to 10 devices via Wi-Fi network, can be purchased starting from 4000 drams.